In His Image Devotional Bible (NLT: New Living Translation) published by Tyndale House Publishers is a great addition to our Bible collection. 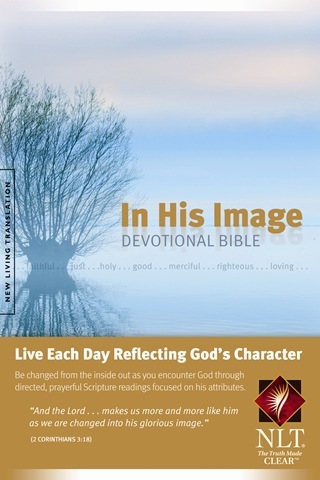 The In His Image Devotional Bible is all about daily, life-changing interaction with God. It is about becoming more like Jesus through the consistent practice of directed, prayerful reading of Scripture. In His Image is a great resource when you want to dig a little deeper into the wonderful attributes of our Awesome God. There are times that I desire a faith boost. With articles like; God is All-Powerful, God is Faithful, God is Righteous, God is Just, God is Holy, God is Truth, God is Ever-Present, God is Creator, God is Merciful, God is All-Knowing, God is Good, God is Unchanging, God is Sovereign, God is a Personal Spirit, and God is Love gives me just the insight I need for the moment. I like the size of In His Image. I’d say it’s chunky, but not over-sized. In Him Image Devotional Bible is just that for me; a devotional Bible. I have personal preferences that I look for in a Bible; NLT is not my favorite version of the Bible (NKJV is my preference), the pronouns for God and Jesus are not capitalized, and Jesus’ words are not red letter. In His Image would make a good gift Bible. In His Image Hardcover retails for $26.99 USD. To find out more about In His Image Devotional Bible or other Tyndale House Publishers products, visit their websites at www.newlivingtranslation.com and www.tyndale.com. Disclaimer: I received a complementary copy of In His Image Devotional Bible from Tyndale House Publishers to review. I am not monetarily compensated for my review. My views and opinions are my own. I do not guarantee a positive or favorable review. I try to present a balanced review.